Pictured, Staten Island woman, Geetha Howie. Image via Facebook. What led to Geetha Howie a 63 year old Staten Island woman being stabbed to death outside of her home by stranger. Did suspect and victim know each other? Geetha Howie a 63 year old Staten Island woman has died after being stabbed to death outside her home by stranger. The attack also led to a neighbor who sought to help the woman being slashed as well. Police sources and witnesses told of the 27 year old attacker, identified as local man, Dantey Moore repeatedly knifing the grandmother in her face and chest, then cradled his victim’s bloody body until police arrived. 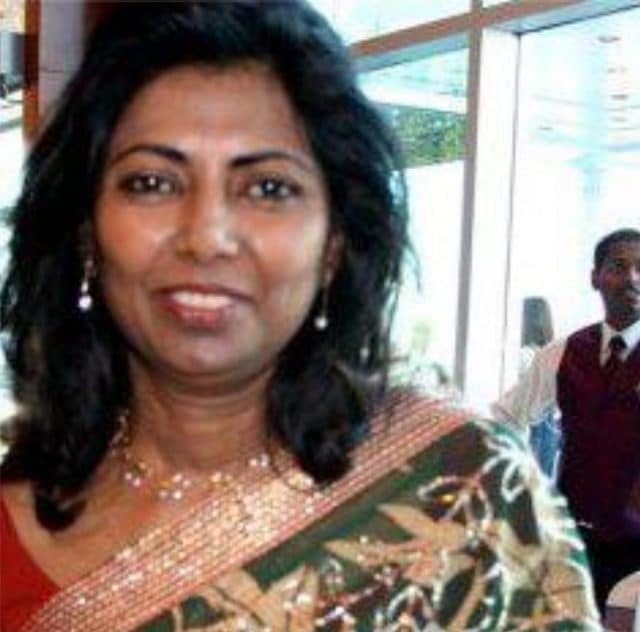 Despite Howie being rushed to Richmond University Medical Center following Monday afternoon’s seemingly random attack, Geetha did not survive her injuries, reported pix11.com. In the aftermath of the attack, police were seeking to determine if the suspect, who lives a few blocks from the attack at Bement Ave. and Bement Court in Randall Manor, had any connection to Howie. Police later told of Dantey Moore having been arrested 34 times since 2007, with the man arrested in several domestic violence-related incidents. Pictured Dantey Moore, the suspect alleged to have fatally stabbed Geetha Howie close to her Staten Island home. Geetha Howie stabbing: Pictured Good Samaritan, Mark Long who had attempted to intervene. Screen shot. Mark Long, 56, the neighbor who tried to stop the attack, said he heard screaming at about 2:15 p.m. and went outside to a horrific sight. Long and the attacker backed up and faced each other the tabloid reported. ‘All I could think about is keeping his attention away from the woman. I just kept asking him, ‘’What’s going on? What are you doing? Why are you hurting her?’’ Long said. That’s when the attacker dropped his knife, crouched down behind Howie and held her, Long said. Adding, ‘He just bent over and put his arms around her and he just stayed there until police and the ambulance showed up’. Adding, ‘At one point, he was trying to cradle her with her head in his lap’. Responding police separated the suspect and Howie. With Howie declared dead one hour later. Charges against the attacker were pending, with police declining not to release the assailant’s name. Of note, Moore suffered from bouts of rage, and had been hospitalized for abusing the drug angel dust, according to two of the man’s sisters. ‘His anger was just building, building,’ said sibling, Cynthia Toye, 23 via the nydailynews. Recently, she added, her brother had been fighting with his girlfriend. It wasn’t clear if the suspect had been under the influence and what his immediate movements were prior to the attack on Howie. That said, nycbslocal cited Howie’s family saying Geetha having just left the bank when she encountered the alleged killer. One relative believes it was a robbery-gone-wrong. In the aftermath of the attack on Howie, family expressed shock and dismay. Howie worked as a lab technician, and was getting ready to start a new job in New Jersey, the son in law told.